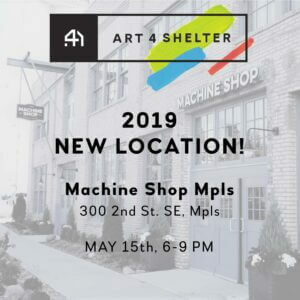 We hope you will participate in the 9th Annual Art 4 Shelter on May 15 at Machine Shop. The deadline for art submission is April 27. We gladly accept paintings, drawings, photography, handmade prints, mixed-media, and collage. All artists who would like to exhibit and donate their 5 x 7 inch work for a great cause are welcome to participate. If you have questions you can email us at art4shelter@gmail.com or contact Elisabeth Loeffler at eloeffler@simpsonhousing.org. This fun, high-energy event brings together hundreds of artists and collectors for a special evening of music, wine, conversation, and art buying to support Simpson Housing Services. First Look Luncheon: 11:30 a.m. – 1:30 p.m.
Tickets go on sale on April 8.